Dedicated to providing quality, cost-effective legal assistance to our clients, Hassler, Kondras, Miller LLP has become known throughout Indiana as a leading Vigo County law firm. Our reputation for thorough legal advice and aggressive advocacy has grown out of decades of experience representing individuals and families in Indiana and Illinois. Established in 1932 by attorney David E. Rosenfeld, our firm is deeply rooted in the community. Our team of highly trained lawyers offers our clients more than 120 years of legal experience successfully handling diverse and often complicated legal matters involving employee rights, injuries and family matters. During a friendly consultation, one of our attorneys will work with you to learn about your circumstances and to help you understand your legal options. We care about our clients, which is why we won't pass you off to a less experienced assistant or paralegal. Instead, you will work with one lawyer throughout your entire case who will answer your questions and guide you through the legal process. Whether you have been harassed by a coworker, your employer has denied you overtime pay, you have been seriously hurt in a car accident or you are involved in a contentious divorce, Hassler, Kondras, Miller LLP is here for you. 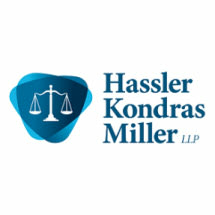 Hassler, Kondras, Miller LLP is conveniently located in Terre Haute, Indiana. We are across the street from the Vigo County Courthouse and the Terre Haute City Hall, on Cherry Street Bayah Way. For more information or directions to our firm, call our office at 812-406-0073.